With respect to the mouths of the Rhodanus: Polybius reproves Timaeus by saying that there are not five but two; Artemidorus says three; Marius, later, seeing that, in consequence of the silting, its mouths were becoming stopped up and difficult of entrance, cut a new channel, and, upon admitting the greater part of the river here, presented it to the Massiliotes as a meed of their valour in the war against the Ambrones and Toÿgeni; and the wealth they carried off from this source was considerable, because they exacted tolls from all who sailed up and all who sailed down it. Nevertheless, the mouths still remain difficult of entrance for ships, not only on account of the impetuosity of the river and the silting up, but also of the lowness of the country, so that in foul weather one cannot descry the land even when close to it. Wherefore the Massiliotes set up towers as beacons, because they were in every way making the country their own; and, in truth, they also established a temple of the Ephesian Artemis there, after first enclosing a piece of land which is made an island by the mouths of the river. Caius Marius (157-86 BC) reorganised the Roman army and raised the number of soldiers per legion from 4000 to 6000, i.e. 10 cohorts of 600 soldiers, each made up of 6 centuries of 100 soldiers. Plutarch (46-125 AD) tells that he arrived to fight the Ambrons and the Teutons near Aquae Sextiae (modern Aix en Provence), probably in 104 BC. He had to wait for them and finally crushed them in 102 BC. His army has been estimated to 5 legions, i.e. around 30 000 soldiers. While waiting for the enemy, he kept his army busy by digging a canal between the sea and his camp in order to ease supply from the sea (see: https://fr.wikipedia.org/wiki/Fosses_Mariennes ). A probable section of the canal, and possible remains of the camp have been found recently by Otello Badan and Mario Maretti (published respectively in 2013 and 2017). Ancient coastline near Marius’ canal (acc. Provansal et al, 2003). 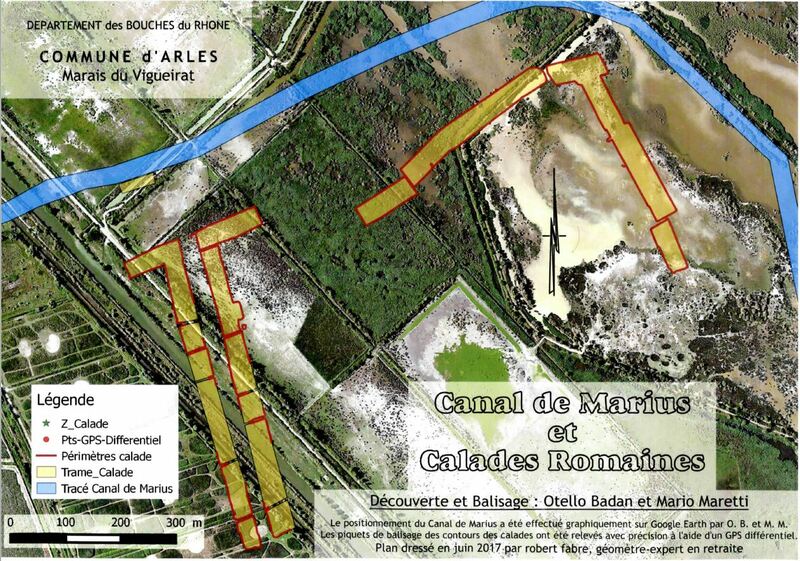 A 5 km long section of a canal was identified by both investigators in 2012-2014, and confirmed by an excavation in 2013 and geophysical surveys in 2014 (published in annual reports of Les Amis du Marais du Vigueirat). At the north, the canal section ends in the present Grand Rhône leading to Arles. At the south, the canal section is lost in the wetlands. Let’s try to put this into its geomorphological context. In Roman times the central Saint Ferréol branch of the Rhône river was silting up and the coastline of the Saintes Maries de la Mer was regressing. The western Peccaïs branch, as a precursor of the present Petit Rhône, was growing and pushing the coastline to SW. The eastern Ulmet branch became the main stream, as a precursor of the present Grand Rhône, and the coastline was moving south. River sediment reaching the coastline was transported eastward by waves and the coastline was moving to the South between Grand Boisviel and Rebatun quite fast at a rate of around 10 m/year. Upon arrival of Marius in 103 BC, the coastline was located somewhere between both positions mentioned on the figure as 2400 BP (around 400 BC) and 2000 BP. Marius’ canal must therefore have had its outlet in this area. The islet La Roque d’Odor (now destroyed) was obviously a nice landmark for seafarers who had no other landmark for landing in this region (MARTY, F., 2017, “L’installation littorale grecque de la Roque d’Odor à Fos-sur-Mer”, Archeonautica, 19, 2017, (32 pp)). The only feature that is missing somewhat in this landscape is Plutarch’s outlet “sheltered from waves” (Marius, chap. 16), except if a sand spit like the They de la Gracieuse would have existed, even if for only a few decades, and this is not unrealistic from a geomorphological point of view. Another interpretation problem of ancient texts concerns the discharge of Marius’ canal which was supposed to take “the major part of the Rhône waters” according to Strabo (Geography, book IV, chap. 1), or at least a “large part of the water of the river” according to Plutarch (Marius, chap. 16). Indeed, the width of the canal, which is estimated to 35 m, does not allow for more than 5 to 10% of the mean discharge of the Rhône river (1000 to 2000 m3/s depending on the month in the year). and, most of all, deviate the Rhône river floods. He could have installed a kind of ancestor of our modern locks. Nature nevertheless had the last word and the canal outlet was eventually closed by sand travelling along the coast to the East. The canal then became a dead arm where black clays brought down by the Rhône river could settle and fill the canal. The difficult access to river outlets mentioned by Plutarch and Strabo are very common and still exist at the present Grand Rhône outlet, so that additional accesses were installed by means of the Port Saint Louis and Barcarin locks. We have some information about a large Roman fortress that was built at Inchtuthil in Scotland (56.5409°N, 3.4264°W) and abandoned shortly after that in the first century AD, i.e. nearly two centuries after Marius stayed in the South of France (Breeze, 2002). This camp was meant to host one complete legion and covered an area of around 25 ha (450 x 550 m). 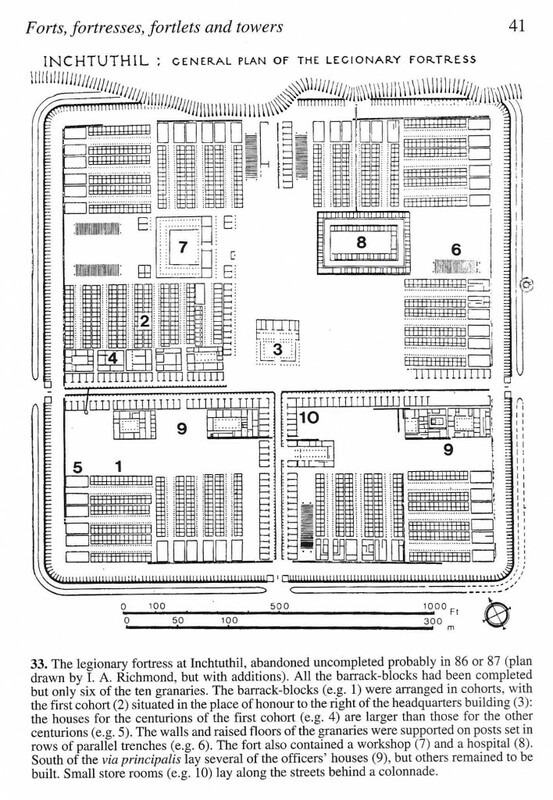 Supposing that each of Marius’ five legions would require the same camp layout, we might deduce that his army would need 5 times more space than at Inchtuthil, i.e. 125 ha, e.g. an area of 1000 x 1250 m.
Further to their discovery of a section of the presumed Marius’ canal, Otello Badan and Mario Maretti continued their search with great success. They found an extensive pavement located inside a curve of the canal at about 0.50 to 0.70 m below the present ground level. An accurate GPS positioning was conducted, showing 30 to 40 m wide stretches paved with pebbles placed in the typical fashion used in the French Provence and locally called ‘calade’. Roman ‘calades’ discovered by O. Badan and M. Maretti, surveyed by R. Fabre. The total length of the paved stretches shown above is around 2200 m, covering over 7.5 hectare. A wild guess would be that these paved stretches are border walkways of the camp. The rectangular camp of 1000 x 1250 m mentioned above would then nicely fit here. Further field investigations will obviously have to be conducted in this area. ARNAUD-FASSETTA, G. & PROVANSAL, M. (2014) « The Lower Valley and the Delta of the Rhône River: Water Landscapes of Nature and History», Landscapes and Landforms of France, World Geomorphological Landscapes, DOI 10.1007/978-94-007-7022-5_20, © Springer Science+Business Media Dordrecht, p 207-218. BADAN, O. (2013) « Sur les traces du Canal de Marius », Bulletin N°158, Les Amis du Vieil Arles, p 26-29. BREEZE, D. (2002) “Roman Forts in Britain”, Shire Archaeology series, N° 37, 72 pp. KILDAHL, P. (1968), “Caius Marius“, Irvington Pub, 191 pp. PROVANSAL, M. et al. (2003) « Participation des apports sédimentaires fluviaux à la mobilité du littoral de delta du Rhône (France) », Géomorphologie : relief, processus, environnement, N°4, p 271-282. RAPPORT ANNUEL D’ACTIVITES, (2013) « Patrimoine historique », Rapport annuel d’activités 2013 des Amis des Marais du Vigueirat, p 90. RAPPORT ANNUEL D’ACTIVITES, (2014) « Patrimoine historique », Rapport annuel d’activités 2014 des Amis des Marais du Vigueirat, p 98. REY, T., LEFEVRE, D., VELLA, C., (2005) « Données nouvelles sur les lobes deltaïques du paléogolfe d’Aigues-Mortes à l’holocène (Petite Camargue, France) », Quaternaire, 16, (4), 2005, pp 329-338. Rome, grandeur et décadence d’un Empire – Rome contre les Barbares , Gardner Films, 2000.